There are benefits to Live Chat? In a competitive market, any edge in sales or service you have over your competitors can make the difference in whether you gain or lose a sale. In this world of automated, touch-tone customer help systems, the ability to chat with a live person through a website is a prominent feature. Having such a feature on your website, especially when a competitor doesn't, may be the crucial selling point that compels a potential customer to choose you over a competitor. As the Internet has matured, online shoppers have become savvier and are expecting more from online sellers. Increasingly, they want their online transactions backed up with live customer support, just as they would have in a brick and mortar store. Live sales and live support chat services are no longer the novelty they once were; they've matured into a serious sales and support tool. Here at All In One Easy Website, we recognize that these days, if you're not using one of these services for your online store, it is possible you are missing out on valuable sales opportunities. These is why we built the live chat integrated service with the All In One Easy Website solution to ensure you do not have to go somewhere else to purchase a software to intergrate this type of feature. To add this feature to your site it cost an additional $14.95 a month. If you are interested in adding a live chat feature to your All In One Easy Website the process is easy. Go to the admin section of you site and you should see an icon titled 'BizLiveChat' or you can select it on the left menu tab. 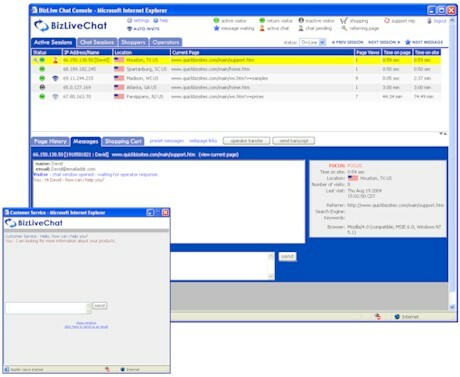 BizLiveChat is fully integrated with the All In One Easy Website solutions. BizLiveChat is the perfect tool to connect with your customers and get the most benefit from your web site presence. Monitor visitors in real time. The BizLiveChat admin console allows you to see what pages visitors are on, where they came from and how long they have been on your site. Provide fast answers and information to your visitors. With the live chat button visitors can click it to start a chat session and ask their questions. Increase sales by providing timely answers and effective customer service. Use the chat invitation and auto chat invitations to prompt visitors to chat. The chat invitations displays an eye catching graphic and encourages visitors to click on it to chat with you.